Habitat: Cat’s Claw is native to the tropical jungles of South and Central America. 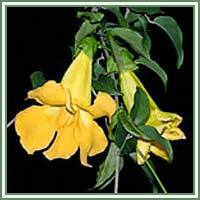 Description: Cat’s Claw is a woody vine with hook-like thorns that look like the claws of a cat. The plant can grow up to 30 m tall. 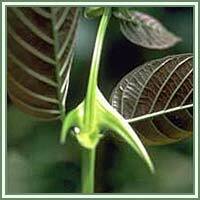 It has dark green leaves, opposite and compound, with small leaflets that grow into ovate to lanceolate leaves. Flowers are trumpet-shaped, bright yellow in color, solitary or in axillary clusters. Fruit is flat and linear, with oblong, winged seeds. Parts used: The inner bark and root. Medicinal use: Cat’s Claw has a rich history of medicinal use. It has been used by Native Americans in treatment of different sorts of ailments: arthritis, digestive complaints, inflammations, wounds and stomach ulcers and as a form of a birth control. Nowadays the plant is recognized by the herbalists mainly due to its antioxidant, anti-inflammatory, anticancer and diuretic properties. The anti-inflammatory effects of Cat’s Claw are very helpful in treatment of rheumatoid arthritis and osteoarthritis. The plant has a very beneficial influence on our immune system, and is being used in the treatments of various types of tumors: brain tumors, leukemia, cervical carcinoma, melanoma, medulloblastoma. It is also used as an herbal supplement in HIV patients. Cat’s claw could also be used in treatments of different sorts of infectious diseases, fevers, wounds, urinary tract infections and internal hemorrhage.